Welcome to Part 9 of the Stitch Sampler Scrapghan CAL! 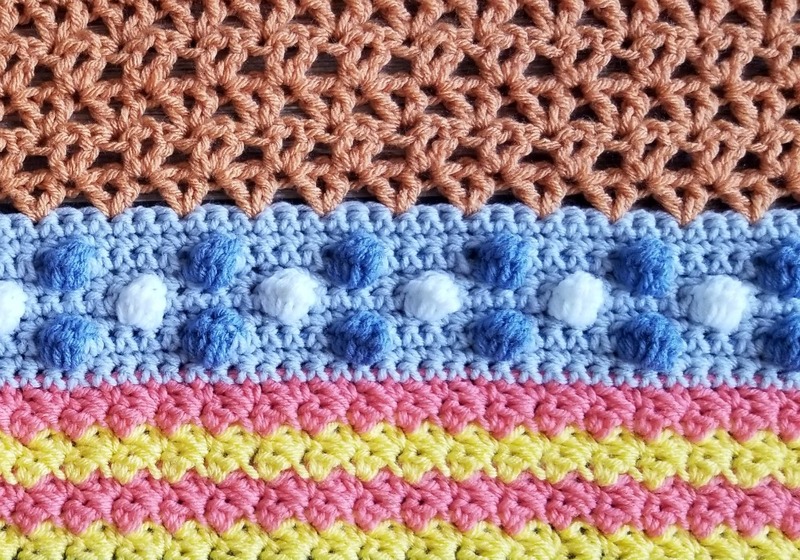 This week is the Bobble Stitch. 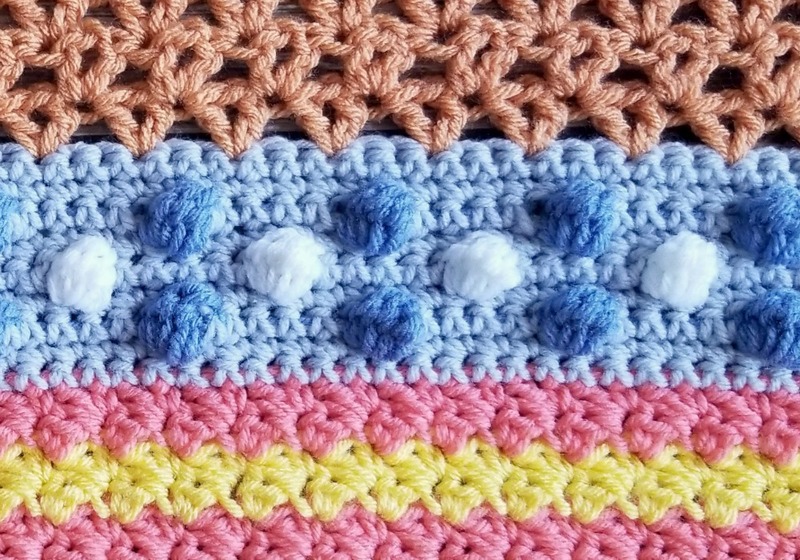 I love this fun stitch! 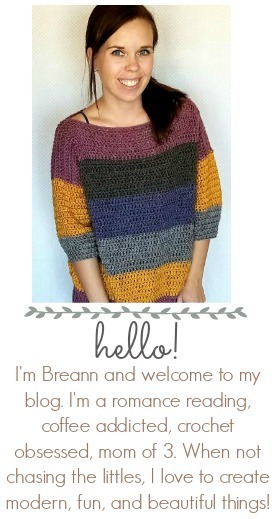 I’ve used in a couple designs like the Bubblegum Beanie, Bobbles of Fun Cowl, and the Sweetheart Sweater. Thank you for following along with this CAL! I’ll see you next Friday with Part 10! I don’t have a video. I can do #9 bobble stitch . & carried 2 color through main color. But, after 7 tries, still can’t do #5 Whisle? It’s the chain 3 loosely, that makes 9dctog, puff stitchy. How hard is it going to be to change colors? So if I’m not cutting the yarn there will be a strand on one of the sides of the Afghan correct? Is there any way to hide this as I think this will look ugly-kind of like the back side of fair isle knitting? 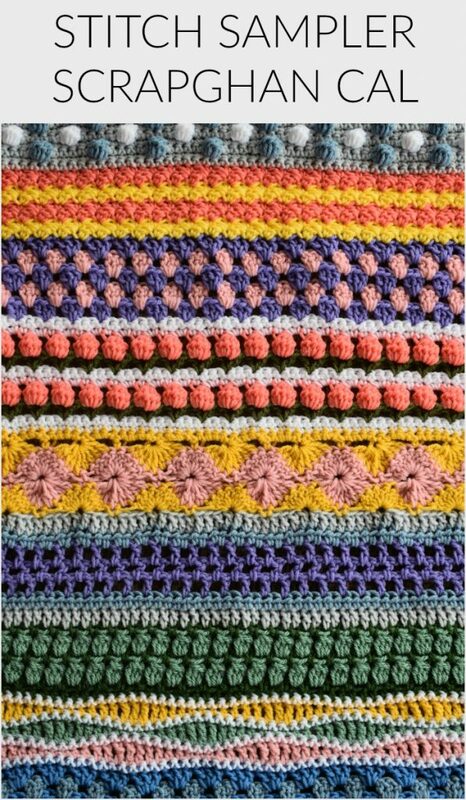 Also do I start the bobble stitch in the actual 3rd sc or 5sc space or is it the stitch after I’ve done 3 or 5 single crochets? Thanks! Just to be clear – on the NEXT row after I make the bobbles, I’ll work over the contrasting color used for the bobbles, sort of “anchoring it”, correct? I should probably cut the yarn I’m using for the bobbles at the end of the row I’ve made them in, even If all the bobbles are going to be the same color as the yarn will be at the wrong end of the row after I crochet back with the single background color. Hmm. 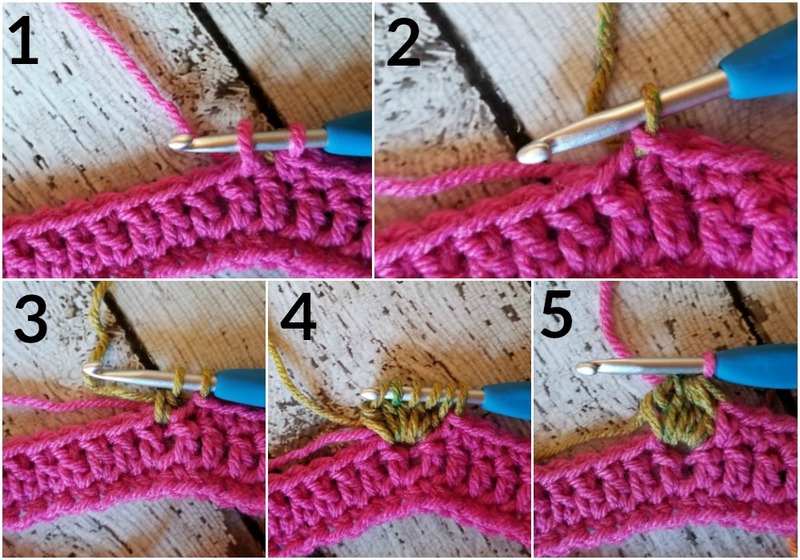 Another use for variegated yarn, so that the bobbles in a given row are different colors? Off to experiment. I’ve never made single crochet bobbles, only double crochet, so this will be a new experience even though I’ve been crocheting for over fifty years (yes, that’s fifty. 5 – 0. Fifty!) Maybe you can answer this question for me – what’s the difference between a “bobble” and a “popcorn”? I always thought they were the same and never made many of either, but lately I’ve seen patterns involving “popcorns” where three to five double crochets are made COMPLETELY in a single stitch or chain one space, not with the last loop “held” as they are for bobbles, then the top of the first of those double crochets is joined with a slip stitch to the top of the last! Thanks! I was actually going to recommend a video I found from the friendly red fox that was extremely helpful. I’m sorry that I don’t know how to insert a link here! I’m noticing though that my bobbles are not as ‘protruding’ as the blanket’s in the image-not sure why. I’d love to see the backside of the blanket in the image. Not sure if I’m doing something wrong with the bobble but I think I’m just going to let it go-it has the contrasting color so I’m fine with that.